Everybody loves a good pun, especially wine puns! Puns are quite popular in parties and small gatherings, and so is wine. Little did you know, puns pair very well with wine… So much that they are used by winemakers themselves. So I came up with a list of wine with a pun in the name. 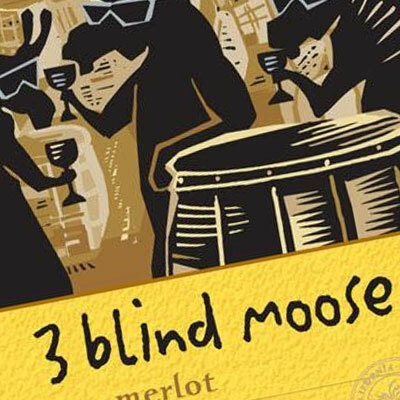 3 Blind Moose – 3 Blind Moose Cellars is located in California, in the Lodi-Woodbridge wine region. Now come on! These moose aren’t blind. In fact, I think those shades are vanity shades because of the un-moose-takable coolness of the label … What? They can make a pun, but I can’t?! 7 Deadly Zins – Sinful indeed! 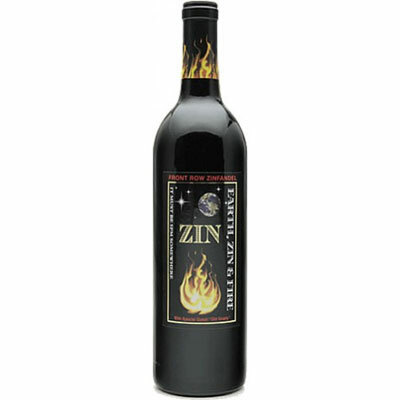 This wickedly delicious Zin is temptation at first sip. 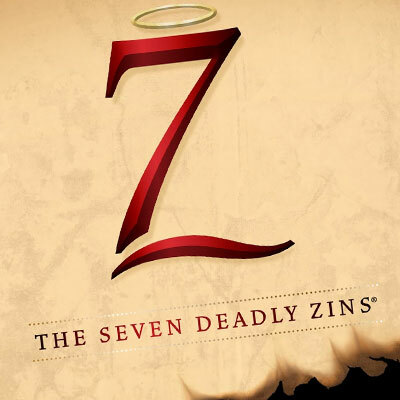 To all saints and sinners alike, 7 Deadly Zins is produced by the Michael David winery in the Lodi AVA, Central Valley. 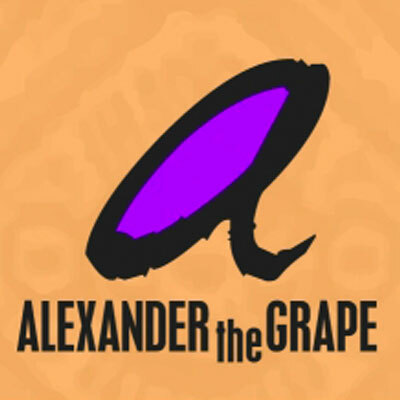 Alexander the Grape – This micro winery is located in the Red Mountain AVA, Washington State. They produce small lots of hand-crafted wine under the management of a larger co-op called Klipsun Vineyards. The obvious double entendre is based on the winemaker’s name (Alexander Gelles) and Alexander The Great. Bearitage – The name is a spoof on the Meritage Association, you know, an American wine blended in the Bordeaux tradition. 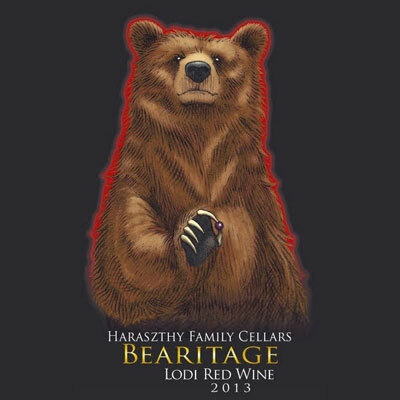 Since they use Zinfandel in the blend, they decided to blend something uniquely Californian (i.e., the state flag which features a bear) and the name Meritage. Thus, Bearitage. The popularity of the Bearitage has inspired a white version called Polar Bearitage, which is a blend of sauvignon blanc and chardonnay. 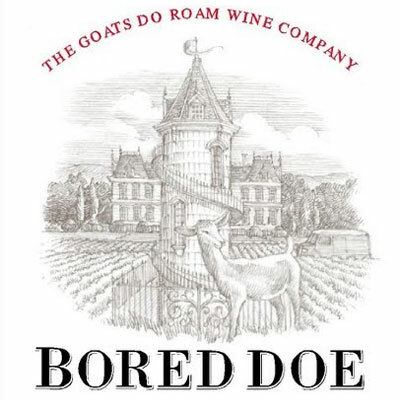 Bored Doe – Bored with tradition and legislation, an udderley gorgeous doe uses her charm and seductive wine names to make a difference in the world of South African wine. Fairview Vineyards & Winery came up with a clever and playful way to nibble at the French wine appellations without getting into too much trouble. 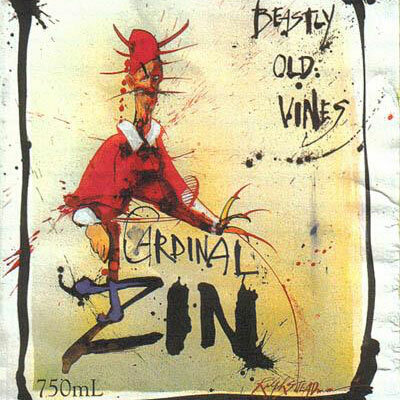 Cardinal Zin – A wine called Cardinal Zin might be tempting to try just because of its name. Bonny Doon Vineyard is a winery in Santa Cruz, California, that focuses on terroir wines. 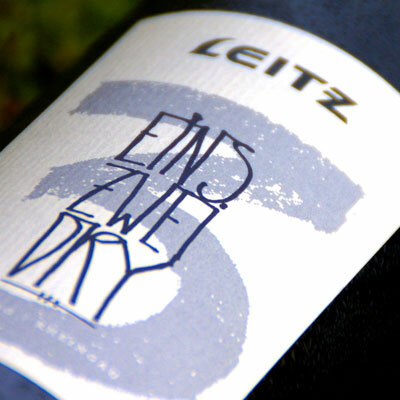 It is perhaps best known for its quirky labels, eccentric mix of grapes, and humorously-named wines. Côte Du Bone Roan – That one is a definite eye-rolling pun! The owner of Rosenbaum Cellars and winemaker Kent Rosenbaum is also a veterinarian, which explains his obvious love for our canine friends. 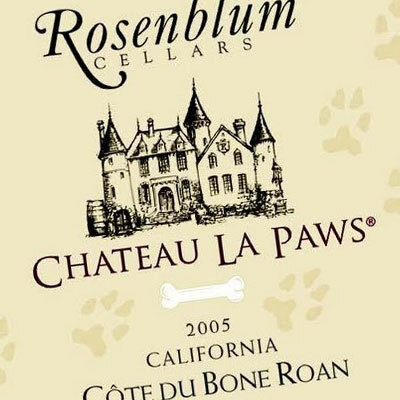 The label mentions the name Château La Paws, directly followed by the picture of a bone. The name of the wine Côte Du Bone is once again a reference to dogs, as well as a play on words with Côte de Beaune, a wine-producing district in Burgundy, France. However, the wine is a Syrah, which is one of the many varietals of the Rhône region, hence the Roan mention in the name of this wine. 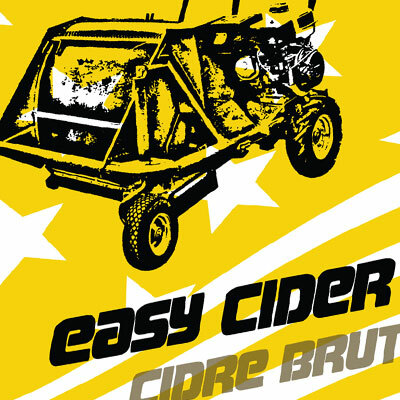 Easy Cider – Normandy cider producer Cyril Zangs indulges in the French fondness for U.S. art house films with this label, an homage to the 1969 film Easy Rider, which starred Dennis Hopper, Peter Fonda and Jack Nicholson. Zangs harvests the apples for his top ciders by hand, but he picks the fruit for Easy Cider by machine. Edmunds St. John Bone-Jolly Gamay – Winemakers around the world draw inspiration from France. Californian Steve Edmunds set out to make wines reminiscent of the Syrahs produced in the northern Rhone, but he also offers a red and a rose made from Gamay, the grape that goes into Beaujolais. 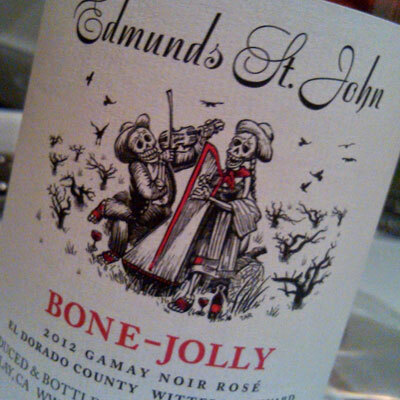 Edmunds calls the wine “Bone-Jolly,” and two skeletons make music on the label. “I wanted to suggest the way in which the pleasure in the taste of good Gamay wine elicits a kind of jolliness in the taster, a kind of jolliness that isn’t just superficial, but, instead, penetrates, right to the bone,” Edmunds writes in an email. 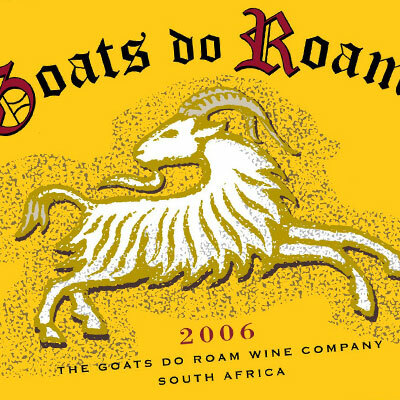 Goat Door – The first one of a series of wine puns from the Goats Do Roam wine company. 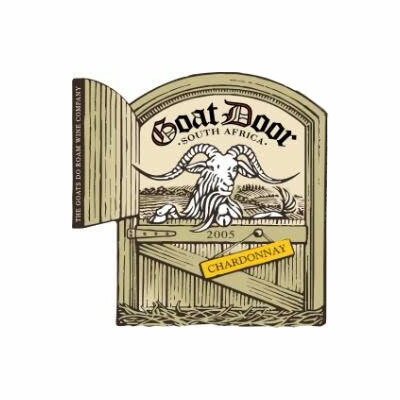 Goat Door is a South African Chardonnay and I presume its name makes reference to Côte d’Or, an iconic region of France in Bourgogne. Goats Do Roam – The ‘legend’ goes that some errant members of Fairview’s long-established goatherd once escaped from their paddock into the Fairview vineyards after Charles Back’s young son Jason accidentally left the gate open. The little group happily roamed among the vineyards, showing rare discernment by selecting some of the ripest berries from the vines – berries that were then used in the making of Goats Do Roam wine. The Institut National des Appellations d’Origine (INAO) has protested at the similarity of these names to the French appellation Côtes du Rhône but owner Charles Back’s defense is that the names are based upon the goats which roam about his Fairview winery. 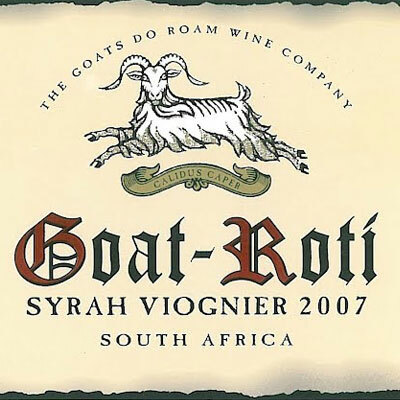 Goat-Roti – An elegant blend of Shiraz and Viognier from Fairview’s farm and the Back family. This one makes reference to another Appellation d’Origine Contrôlée called Côte-Rôtie, located in the northern Rhône wine region of France. 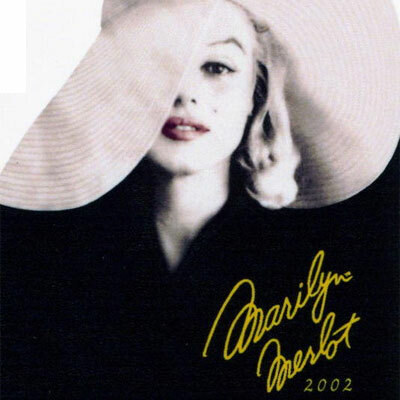 Marilyn Merlot – An obvious take on Marylin Monroe. The story behind the brand includes a bit of Hollywood serendipity. Bob and Donna Holder, principal owners of Marilyn Merlot wanted something cute and memorable. Donna said, “Why not call it Marilyn Merlot?” The idea just hung there, and it really seemed like a clever name, recalls Bob Holder. The winery being fond of puns did not stop there and released a sparkling wine called Blonde De Noirs, making an obvious reference to Marilyn’s beautiful blonde hair and blanc de noir – French term for “white wine from red grapes.” In particular, the phrase blanc de noir is used with those Champagnes, and other sparkling wines that are made entirely from the pinot noir grape. 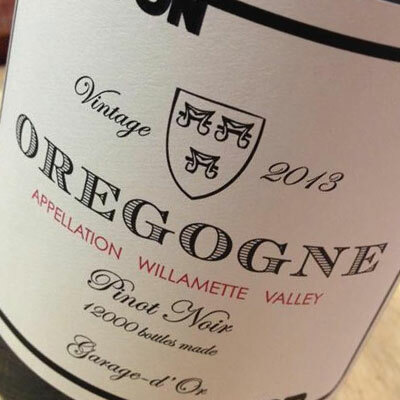 Oregogne – André Hueston Mack began making wine in Oregon in 2007 under the Mouton Noir label, and he quickly showed a flair for designing attractive labels. This one is for a Pinot Noir from the Willamette Valley, a region whose Pinots are often compared to those of Burgundy, the home of the world’s greatest Pinot producers – I should know! Mack alludes to that relationship with his spelling “Oregogne,” a play on “Bourgogne,” French for Burgundy. 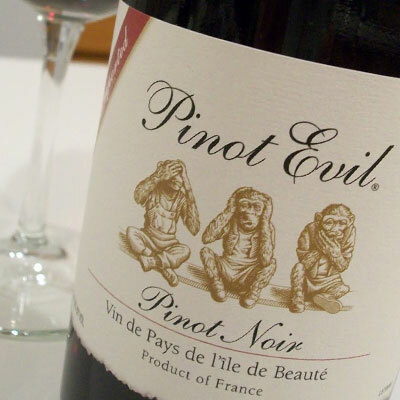 Pinot Evil – This is a funny take on the Three Wise Monkey proverb “See No Evil, Hear No Evil, Speak No Evil” which are featured on the wine label. This wine is being sold everywhere for under $10. I’ve also seen it online for less than $5! I have read mixed reviews of this wine but have not tried it myself. Pithon-Paillé Grololo – No group of winemakers is fonder of sexual puns than the French, and some of their labels are far too risqué for U.S. shelves. Pithon-Paillé Grololo is slightly tamer. Jo Pithon et Joseph Paillé chose the name “Grololo” for a red wine from the Loire Valley made from the rare Groslot or Grolleau grape. The first three letters of “Grololo” suggest gros, the French word for large or big. Lolo is a word that French children use to refer to breasts. Producer Jo Pithon noted that the wine was once used at a California fundraiser for breast cancer. René Pogel – Wolf Blass Wines was established in 1966 by Wolfgang Blass, a German immigrant who arrived in Australia in 1961. 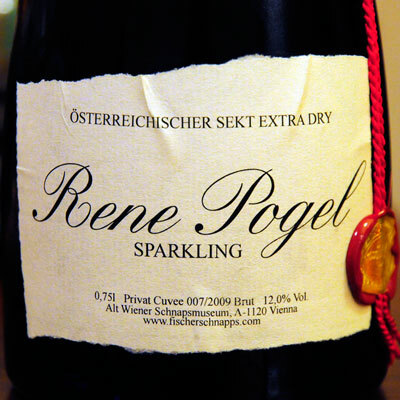 Wolf Blass created a sparkling Australian red wine called René Pogel. When people inquired who this person was, Blass advised them to read the name backwards (Leg Opener). This innuendo caused offence and so the wine was withdrawn from sale. Rhoning Stones – Composed of 60% Grenache, 30% Syrah and 10% Mourvèdre, this wine comes from Côtes du Rhône, France. It is the stones of the Rhône river that set this region apart from any other region. These smooth and round pebbles force the vines to work their way into the ground to find nutrients, pushing their roots deep into the earth. 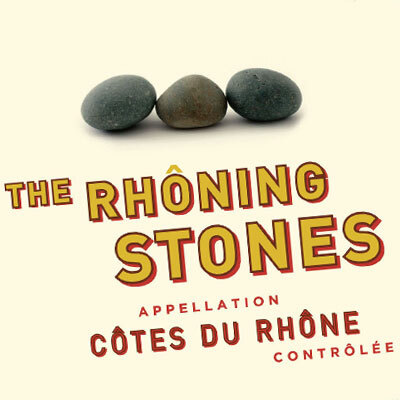 They are stones from the Rhône river, hence the name “Rhoning Stones”. Route du Van – Every French wine region has its route des vins, or wine route, a road that traverses the vineyards in the area and that wine merchants and tourists flock to. 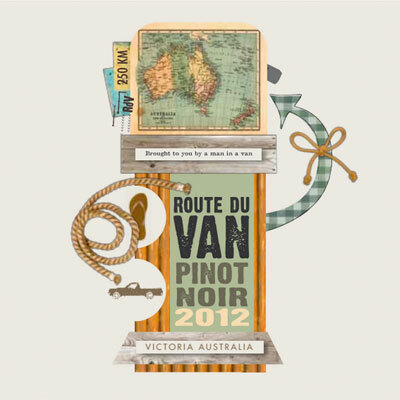 Australians Tod Dexter and brothers Ian and David Bird riffed on the term in naming their Route du Van, which makes reasonably priced wines from grapes grown in the Australian state of Victoria. 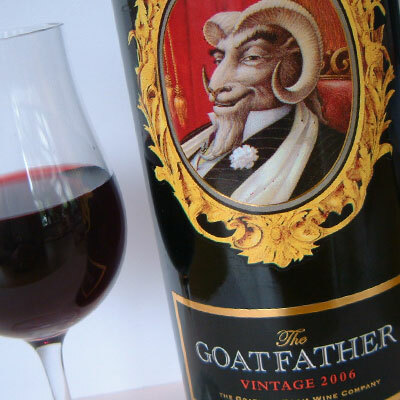 The Goatfather – An intriguing mix of Sangiovese, Barbera, Nebbiolo, and Cabernet Sauvignon, crafted by the Goats Do Roam wine Company. Considering most of these varietals are from Italy, the name of the wine is quite appropriate. And remember… Great wines are not born great, they grow great. 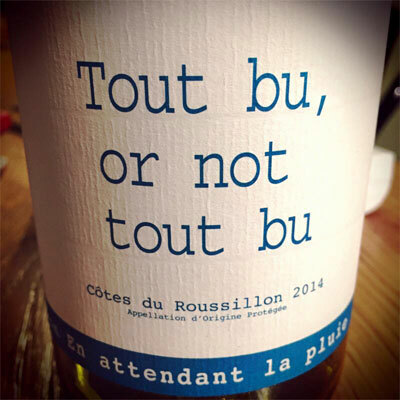 Tout Bu, Or Not Tout Bu – This label from Loïc Roure, a vigneron in Roussillon in southern France, is a bilingual gag for a red wine made from Grenache and Mourvedre. The words on the label are pronounced more or less like, “To be or not to be,” the opening words of a famous soliloquy in William Shakespeare’s play Hamlet. In Franglish, they mean something like “All drunk, or not all drunk.” Roure is a so-called natural winemaker, one that tries not to use chemicals either in growing grapes or making wine from them. Wild Boar Doe – Say the last two words quickly and you’ll get the joke. Yes, this is a Bordeaux blend, of 40% Merlot, 23% Cabernet Sauvignon, 17% Malbec, 15% Petit Verdot, and 5% Cabernet Franc, aged in oak for 20 months. 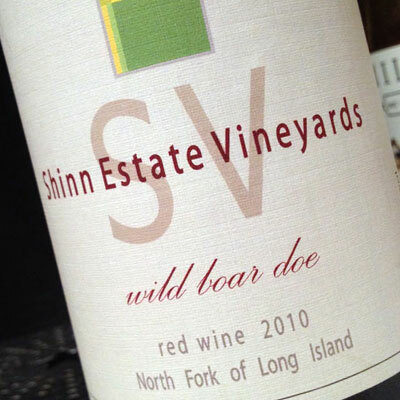 Shinn Vineyards, a wonderful winery on Long Island, makes “Wild Boar Doe”. 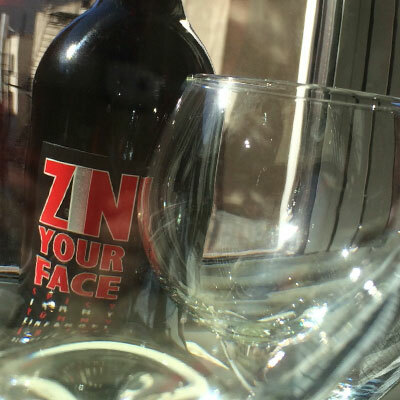 Zinfatuation – This Zinfandel comes from the Trinchero Family Estates in Napa Valley, CA. The various reviews I’ve read are quite mixed, but everyone remains infatuated with the name of this wine! How does one license a wine name? I’ve heard that question a few times from various people, and not knowing the answer myself, I asked my good friend and winemaker Antonio Moretti, from Moretti Wines (Sta. Rita Hills AVA). When a winemaker makes a new wine, he needs to create a new label. Along with the label, he then submits a formal request to the TTB (Alcohol and Tobacco Tax and Trade Bureau). Once they receive the request, they analyze every aspect of the content from name to appellation, to varietal and so on. They even check if there is any immoral content!!! But most importantly, they need to know the alcohol content which will determine how much tax is owed to our good friend Uncle Sam. This can be a long process, sometimes up to three months. There’s also the option to copyright and trademark the name, but most wineries don’t do that.